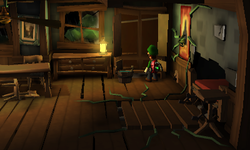 The Gardener's Dwelling is a room inside of the Haunted Towers in Luigi's Mansion: Dark Moon. The Gardener's Dwelling can be accessed by taking the north door inside of the East Hall. Inside the room there is a table with four chairs, a stove, a cabinet, a wardrobe, and a bed. There is a window by the stove that Luigi can use to peer into the Old Graveyard. The ceiling fan can be used to move the bed inside the wall, revealing an elevator that takes Luigi to the Gardener's Lab. By the bed is a poster that Luigi can rip off to reveal a Bulb. Taking the south door takes Luigi back to the East Hall. In The Pinwheel Gate, Luigi needs to go to the Gardener's Dwelling to seek out one of the Hiders that took a vane from the Pinwheel Gate. However, the Hider escapes into the Gardener's Lab before Luigi can chase him. In Graveyard Shift, three gold mice are in the room. In Doggone Key, there is a bat inside of the stove and spinning the ceiling fan yields money instead of opening the passage to the available Gardener's Lab. In Hostile Intrusion, the Gardener's Dwelling may be one of the rooms that is infested with ghosts. This page was last edited on August 27, 2018, at 01:46.